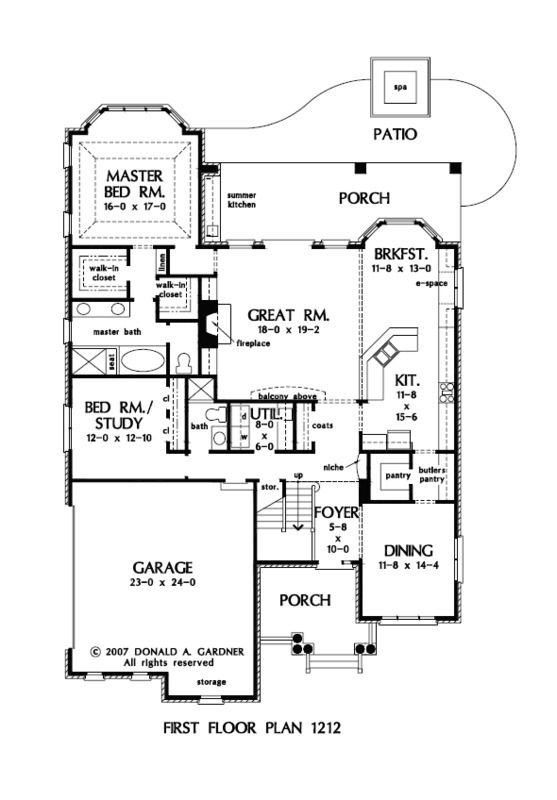 The traditional version of a plan with three exterior choices is designed for relaxation and comfort. The master suite is a pampering oasis with its spacious bedroom with tray ceiling and bay window. Dual walk-in closets mirror the twin vanities, which provide convenience. The great room is centrally located and accesses the rear porch with summer kitchen. Nearby, the kitchen and breakfast room also include an E-space that serves as a perfect computer nook. The kitchen has an adjacent walk-in pantry and butler's pantry that divides it from the dining room. 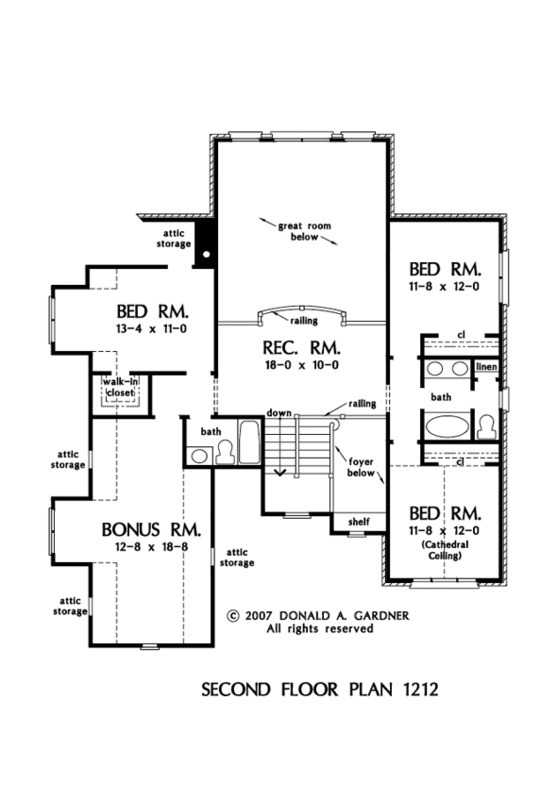 Upstairs, three bedrooms are positioned to flank a large rec room, while the second floor also features a bonus room. 2nd Floor: 1007 Sq. Ft.
House Dimensions: 49' 11" x 75' 5"
Bedroom #4 (Cathedral): 11' 8" x 12' 0" x 13' 4"
Bedroom / Study : 12' 0" x 12' 10" x 9' 0"
Bonus Room : 12' 8" x 18' 8" x 8' 0"
Deck / Patio : 39' 4" x 10' 6" x 0' 0"
Dining Room : 11' 8" x 14' 4" x 9' 0"
Foyer (2 Story): 5' 8" x 10' 0" x 18' 1"
Garage Storage : 10' 10" x 3' 0" x 0' 0"
Great Room : 18' 0" x 19' 2" x 18' 1"
Kitchen : 11' 8" x 15' 6" x 9' 0"
Porch - Rear : 32' 4" x 10' 0" x 0' 0"
Porch - Front : 12' 1" x 9' 8" x 0' 0"
Rec Room : 18' 0" x 10' 0" x 8' 0"
Storage (1st Fl.) (Sloped): 3' 4" x 3' 8" x 0' 0"